Miyajima Valley (宮島峡) is located in Koyabe, Toyama Prefecture. 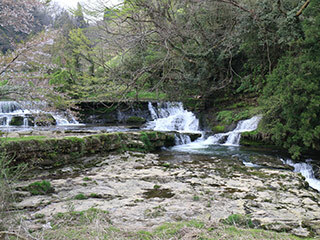 It is about 5km long small valley with three beautiful waterfalls. It has a nice riverside walk that you can enjoy all the waterfalls. It has also Onsen town around here. There are parking and restroom. 1. use Ainokazetoyama Line Isurugi Station. It is 3m tall waterfalls. It is 5m tall and wide waterfalls. It is 3m tall and 40m wide waterfalls. It is like a Niagara Falls. Legend said, at this pot, a dragon lives here.